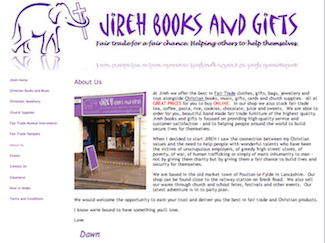 This entry was posted on May 8, 2012 by Phil Groom, in News and tagged Bookshop Closure, Bookstall Service, Dawn Parkes, Economic Crisis, Fair Trade, FairTrade, Jireh Books & Gifts, Lancashire, Poulton-le-Fylde, Shop Closure. Bookmark the permalink. THE ECONOMIC CRISIS has hit another Christian retailer as Jireh Books and Gifts of Poulton-le-Fylde, Lancashire, have been forced to close the shop down due to the rising costs of rents and other circumstances beyond their control. The shop closed its doors at the end of April, but Dawn Parkes, who owns the business, is not one to give up just like that and is pressing on with running stalls at events and parties all around the area, with an emphasis on fairtrade. Please pray for Dawn in her rovings and if you’re in the area, or have contact with churches/community groups in the area, please consider inviting or encouraging them to invite her along.